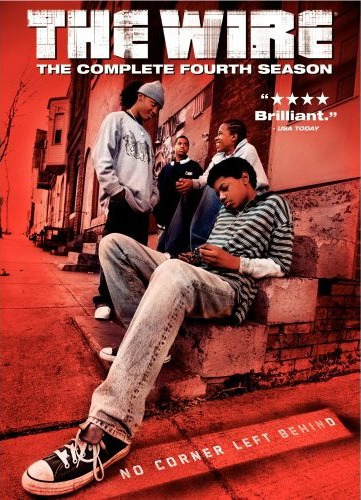 As the vitriolic mayoral race continues, season four of the HBO drama series focuses on four boys from West Baltimore who balance attending school with the temptations of crime. THE REVIEW: A pattern that’s become evident with The Wire is that each season stands out on the whole. Over the course of thirteen episodes (as is the case in season four; two and three were only twelve episodes long), the story that’s developed comes to fruition and you complete another cycle of beginning, middle, and end. While there is overlap and recurring characters over the years, each new season of The Wire constantly proves itself and doesn’t just rely on built-up goodwill from seasons prior. Individual moments of greatness do appear in specific episodes, but it’s when taken as a whole season — one continuous story — that the brilliance of David Simon and the other writers is demonstrated. In my concluding thoughts for season three, I briefly mentioned how brilliant the season finales are. Well season four is no different and is a great illustration of the positives this time around. Season four is about change: new Mayor-elect Thomas Carcetti (Aidan Gillen) is trying to fix Baltimore, Detective McNulty (Dominic West) has all but put his past behind him and sobered up, a group of school kids go through a multitude of changes with Namond Brice (Julito McCullum) among the few selected for a “special program”, and the drug scene barely looks the same with Marlo Stanfield (Jamie Hector) calling the shots along with Proposition Joe (Robert F. Chew) and the rest of the co-op. One of Steve Jobs’ many famous quotes goes as follows, “You can’t connect the dots looking forward; you can only connect them looking backwards.” As I made my way through each episode, it felt like something was missing. Not just like seasons past where I’ve complained about minor characters lacking attention or simply the mystery and confusion associated with trying to solve whatever major case there happens to be. In fact, season four lacks such a major case and instead focuses more on these “change” elements that occur over all thirteen episodes. Yes, there is the search for the bodies that Chris (Gbenga Akinnagbe) and Snoop (Felicia Pearson) disappear in the vacants, but it’s mostly forgotten about the police until episode eleven, “A New Day”. No, it felt like something was missing this season because there was something missing: McNulty. This isn’t to say McNulty has been the only good part of The Wire or even the character the show revolves around the most. Far from it. With the exception of maybe season one, I would argue that McNulty isn’t even the main character despite being top billed and the one we’re “forced” to see as most important. But having him be almost completely absent is noticeable and has a profound impact. You begin to realize that he was a big driving force of the show who kept things moving and interesting. Besides Lester Freamon (Clarke Peters), McNulty is the question guy always digging up dirt and going against commands: the rebel who charts new and unexpected territory. Now that he’s all but disappeared, so goes most of the “interest” we’ve come to know from the show. However, this doesn’t mean season four is boring, uninteresting, or in any way subpar. In fact it manages to maintain it’s appeal but in new ways. We’re forced to looking deeper at issues and problems that are arising. Sergeant Carver (Seth Gilliam) is probably the best example of this. Before, Carver was just the muscle along with Herc (Domenick Lombardozzi) who did most of the grunt work. He even spied on the detail in season one which faced the ire of Lieutenant (now Colonel) Cedric Daniels (Lance Reddick). Now in season four, he’s taken the advice of what it means to be “good police” and has familiarized himself with the people (read: repeat offenders — the “corner kids”) he interacts with on a daily basis. As a result, we start seeing things from a different angle. Most of the stories are the same (drugs) but with a new, younger, perspective. It’s not just a rehash of old ideas in a new package (no pun intended), but rather an entirely new package altogether. THE TAKEAWAY: What all this is trying to convey is that The Wire still has the goods. Season four is yet another departure from the ideas and norms established in the first three seasons but still maintains the appeal we’ve grown to love. There’s no “main investigation” that runs throughout the season like in the past; there is an investigation but it’s ignored for most of the middle. Despite the lack of an investigation to serve as a driving force, I would argue this is the most intriguing and suspenseful season to date. It doesn’t match the end of the third season but season four still packs a punch and changes so much of the game that we’re forced to keep on our toes. You can never relax and take a break because once you do, the rules of the game are changed. The Wire always keeps you thinking and guessing about what’s coming next. That’s what makes this such a great show, and this such a great season.